By studying the behavior of a deck of cards, and stacks of other materials, like steel and aluminum, scientists at Drexel University are proving the existence of a buckling phenomenon that happens inside layered materials when they are put under pressure. The discovery could shape the way researchers – from structural and mechanical engineers to geologists and seismologists – study the way things deform under pressure. This phenomenon, described as “kinking non-linear elastic” behavior by the researchers in Drexel’s Department of Materials Science and Engineering who first reported it in 2016, is best described as the separation and buckling of the internal layers of a material as they are compressed from the sides. Common examples are the way the cards in a deck of playing cards bend when you squeeze them from the edges without allowing the cards to separate, or how a ripple will sometimes form in a carpet if it is pushed from the edge. In pressurized environments like this, whether at the card table or in the middle of tectonic plates, something has to give. Their theory explains exactly what that “give” looks like and how it happens. In their recent paper “Ripplocations: A Universal Deformation Mechanism in Solids,” published in the journal Physical Review Materials, the researchers provide the first look at these internal waves, dubbed “ripplocations,” that can be observed by the naked eye. Barsoum’s previous work suggested the existence of ripplocations by using atomistic simulations of bulk materials. 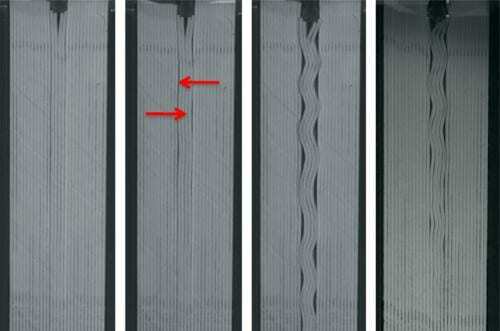 This report clearly demonstrates the formation of ripple bands – interior layers that are buckled in wave-like formations – as they form in a stack of cards, thin steel and aluminum sheets when they are laterally compressed while confined. “The experiment we carried out is quite simple actually. In one case, we confined a deck of cards from the sides and pushed on them from the top. At a given load, buckling occurs, but because the deck is confined, they behave as waves that are fully reversible,” said Leslie Lamberson, PhD, an associate professor in the College of Engineering and a co-author of the paper. “Using atomic simulations we show that in graphite, like in the card deck, ripplocations nucleate sometime before the material reaches its failure point and until it reaches that point, the behavior is fully reversible – if the pressure is removed, the ripples dissipate and the layers return to their original shape,” said Garritt Tucker, PhD, an assistant professor at the Colorado School of Mines and a co-author of the paper. They also observed that ripple bands form all at once, with the waves emerging en masse as the load is applied. The height of the ripples, or amplitude, increased with the load. Barsoum suggests this research could one day inform geologists studying the deformation of layered geologic formations, as well as helping us to better understand the plate tectonic behavior that cause earthquakes. “The research on the deformation of layered systems in general has been on their failure. In this work, we show that there is an important, non-linear elastic regime that precedes failure that has, as far as we are aware, been almost totally neglected. The case we made, however, that understanding this regime is crucial and fundamental for understanding all others,” they write. This research was supported by the National Science Foundation. Drexel researchers Xingyuan Zhou, Sam Shanazarov, Andriy Romanchuck, Stylianos Koumlis, Steven Pagano, Leslie Lamberson, and Garritt Tucker from the Colorado School of Mines.